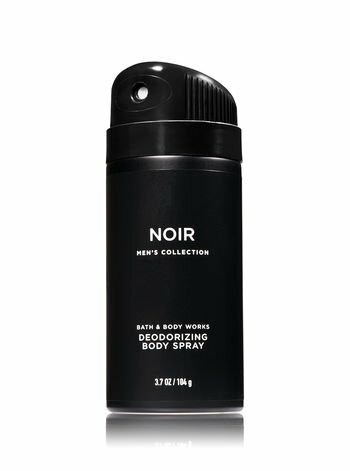 Bath & Body Works Noir Men's Deodorizing Body Spray. 3.7 Oz / 104 g. FRAGRANCE: Add an air of mystery with this exotic blend of black cardamom, smoky vanilla & a hint of musk. OVERVIEW: Our NEW Men's Collection, featuring Deodorizing Body Spray designed just for him! All-over body spray with an unforgettable, masculine scent and deodorizing protection. Use in the morning, after the gym or to refresh yourself throughout the day. OVERVIEW: Our NEW Men's Collection, featuring Deodorizing Body Spray designed just for him! All-over body spray with an unforgettable, masculine scent and deodorizing protection. Use in the morning, after the gym or to refresh yourself throughout the day.